The other night I was laying in bed for hours, teetering on the edge of sleep— barely conscious but not yet asleep. You know the feeling. During those moments, our brains are usually filled with either to-do lists for the following day or reflections on the day we just had. But the other night wasn’t one of those typical nights for me. It was in those hazy pre-sleep moments that a whole whack of inspired thoughts rushed into my head — answers to questions that have been floating around in my mind, unanswered for months. Resolutions to burdens that have been weighing on my chest. Inspiration for future articles (and other exciting things!) for this website. These seemed to fly into my consciousness, one by one. A lone thought would float in my head, meandering for a while until I took the time to write it down. Once I wrote one down, another one would rush in. You should see my bedside journal – filled with chicken scratched notes. I am surprised I can even read them. Thankfully, I can. And thankfully, I knew enough to know that these thoughts were more than just presleep brain work – they were the answers I’d been asking for from my spirit guides for quite some time (plus some!). When we’re doing our typical “mindless” stuff: laundry, dishes, driving to work – when your mind isn’t working on a task, you’re more likely to have one of those “aha!” moments – a flash of inspiration or the answer you’ve been waiting for. 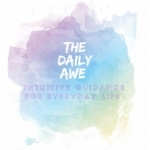 You don’t need to be a professional intuitive or psychic or a champion meditation guru to receive Divine Guidance. You just have to be a person who sleeps, cries or does your laundry. You do at least one of those, right? Interested in learning more about your spirit guides? Learn more about spirit guide readings by visiting my Spirit Guide Readings page. spirit guide, signs from spirit guides, how to talk to my spirit guide, how to talk to spirit guides, meet a spirit guide, meeting spirit guides, spirit guide reading, spirit guide psychic reading, what is my guide's name?